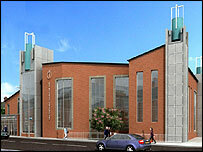 A church which gave birth to Aston Villa Football Club is to be demolished and rebuilt as part of a £4m project. 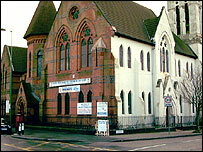 The New Testament Church of God, on Lozells Road, Birmingham, was originally called the Aston Villa Wesleyan Methodist Church. The football club was formed in 1874 when four members of the Wesleyan congregation met under a gas lamp opposite the red brick building. The 155-year-old church will be flattened due to the cost of repairs. The club was set up to provide winter sport for the church cricket team. The building, which was bought by the New Testament Church of God in 1962, has since become a focal point for the local black community. Planning permission to demolish the church has been approved and it is hoped work on the development will begin as soon as possible. The church's Senior Pastor Bishop Derek Webley said they were keen to maintain links with the football club. "It's important in terms of history that something in the new building reflects the old. We're not sure what that will be yet but we feel there should be some kind of link." Aston Villa's development and association with the church helped establish league football. Scottish businessman and Methodist William McGregor was a leading light at the club. His organisational skills and ambition helped found the first league of 12 clubs in 1888 - the first such competition in the world.